Summer is almost over. It went by fast, didn’t it? Though I hate to see it go, I'm glad it always ends with “The Great Minnesota Get-Together” at the state fair. Our state fair is one of the top five blue ribbon fairs in the country with attendance totaling about two million visitors over the ten-day event, ending on Labor Day. I love the fair and go almost every year with my family. The main attraction is, of course, the food! Everything comes on a stick and is usually deep-fried, but it’s hard to resist. The moment you walk through the entrance you’re in junk food heaven—pronto pups, cheese curds, French fries by the bucket, pizza, bacon-wrapped turkey drumsticks, foot-long hot dogs, pork chop on a stick, to name a few. We even have tater tot hot dish on a stick! (Don’t ask me how they manage that one. I’ve never had it.) I can’t even begin to name all of the desserts, but some of the most popular ones are the mini-donuts, Sweet Martha’s chocolate chip cookies, the Minneapple (deep-fried) Pie and of course, who can resist the caramel apples, deep-fried Twinkies and Snickers Bars? Yikes! I’m getting sugar overload just listing them! There are a lot of fun things to do besides eat. We always walk through the horse barns. I love looking at the beautiful horses. Then we visit the miracle birth center and see all of the newborn farm animals. It’s hot in there and packed with people, but I can’t resist looking at all of the sweet baby lambs, piglets and calves. We check out the DNR Building, the Heritage Center, the International Bazaar and spend some time at the band shells, listening to live music. One of my favorites is the Creative Arts Building. My daughter, Misty, and I look at all of the handmade quilts, sweaters, clothing and needlework. Every year I gaze at those jars of homemade jams and tell myself I’m going to learn how to do that. That’s my “end of summer” ritual. What’s yours? A vacation or family reunion at the cabin? As I mentioned in a previous post, I had a lovely long weekend with girlfriends this summer. After that, I had one day at home, and then got on a plane. 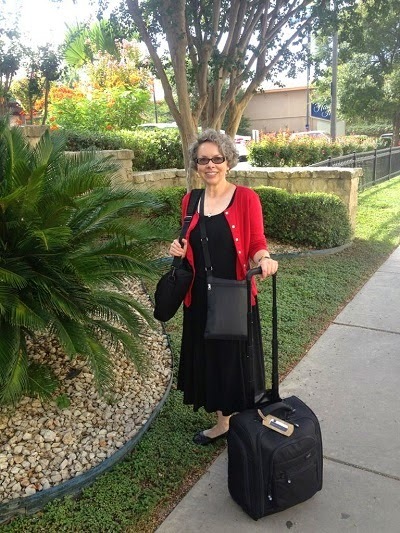 I flew from Louisville, KY to Dallas, TX to San Antonio, TX for the annual conference of Romance Writers of America. 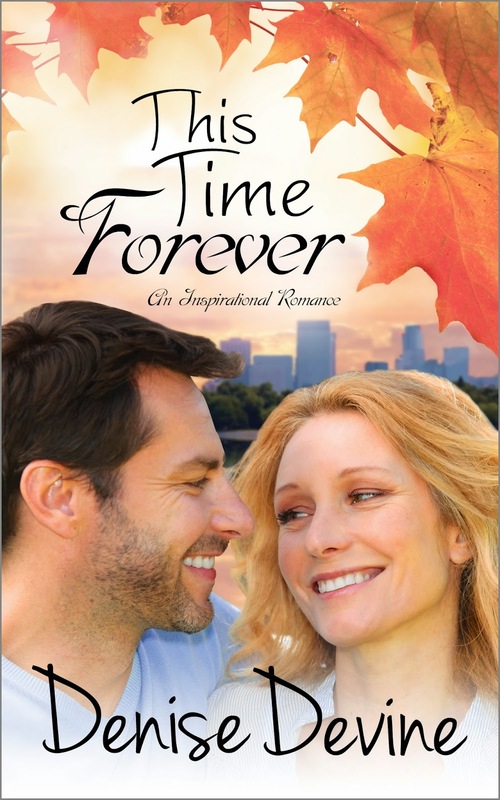 I had a wonderful conference experience, including a chance to meet in person for the first time with several of the authors from Sweet Romance Reads: Melinda Curtis, Margaret Daley, Denise Devine, Patricia Knoll, Kristin Wallace, Merrillee Whren. The girlfriend weekend was shorter but I took a larger suitcase because I traveled by car. Yes, you read that right. I went on a longer trip with a smaller suitcase. I didn't want to check any luggage, so I took only my laptop bag (with my skinny purse stuffed into it) and one carry-on. I have always wanted to pack light, but this is my first time actually doing it. It always seemed it would be more adventurous to have a great vacation (or conference) without dragging along every item I own. For RWA I took two black dresses exactly alike, a black/white dress, and five lightweight jackets: red, white, black, blue, green. Also a sparkly silver shawl for the awards event. I packed one pair of shoes. Every day I would wash a dress in Woolite and hang it in the shower to dry. My roommate Maddie James was gracious about letting me do this. I couldn't bring back tons of books. Tons of books are given away at RWA. It's wonderful! But if I had brought them back, or shipped them to myself, I wouldn't have had anywhere to put them. (I downsized and no longer have a bookcase, per se.) I would have had to give the books away... So I gave them away while in San Antonio. I mostly read ebooks, if you're wondering. I can't think of any more disadvantages. Unless you count having to do the Woolite thing, which to me was part of the adventure. No extra stuff to drag from the cab to the check-in thingie. No extra charge for a checked bag. Zero time spent at the baggage retrieval thingie. I got home five hours earlier. Does the last one surprise you? My flight out of San Antonio was delayed, which meant that I would miss my connecting flight from Dallas to Louisville. I did a little research, and then confabbed with This Guy who was going to pick me up at the Louisville airport. He agreed to my idea, that instead of flying from Dallas to Louisville, KY, I would get a plane from Dallas to Indianapolis, IN. It was two hours more driving total, but we got back to our little town in Southern Indiana closer to 7PM than Midnight. It was a win in our opinion, and it was easier to manage because I didn't have to worry about where my suitcase would land. This is one example of how my life has been simplified by adopting more of a Minimalist lifestyle. I have found that having less gives stuff gives me more time/energy/space/freedom to enjoy life. Oh! The photo above was taken by my terrific cousin who drove from Waco, TX to meet me for breakfast and then take me to the airport in San Antonio. That was another part of my great conference experience! 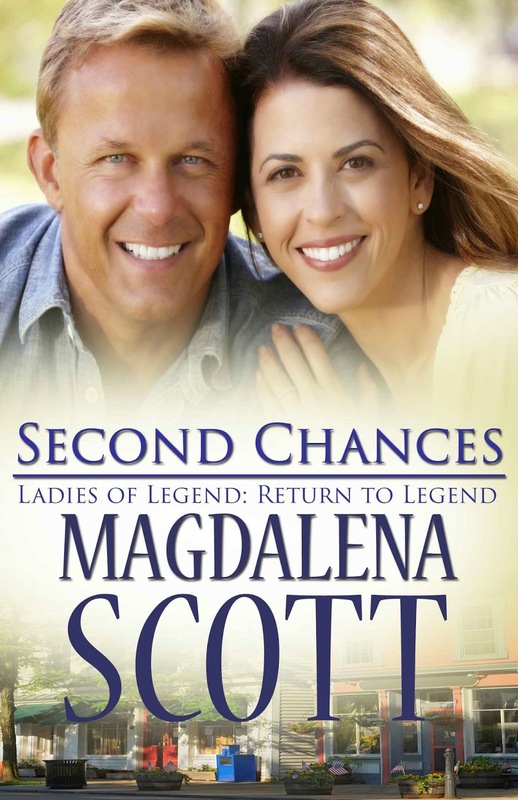 Magdalena Scott is a bestselling contemporary author of the Ladies of Legend series. Please visit her website. 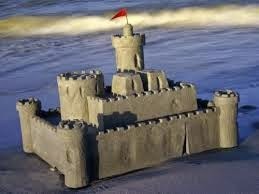 We recently returned from the beach, and had an awesome family vacation. One of the things that made it so lovely was that all six of our children could come, at least for little patches of time during our rental week. Another element that made the time special was that we got back to basics. We frolicked in the waves, walked on the shore, read plenty of books, and played group games. 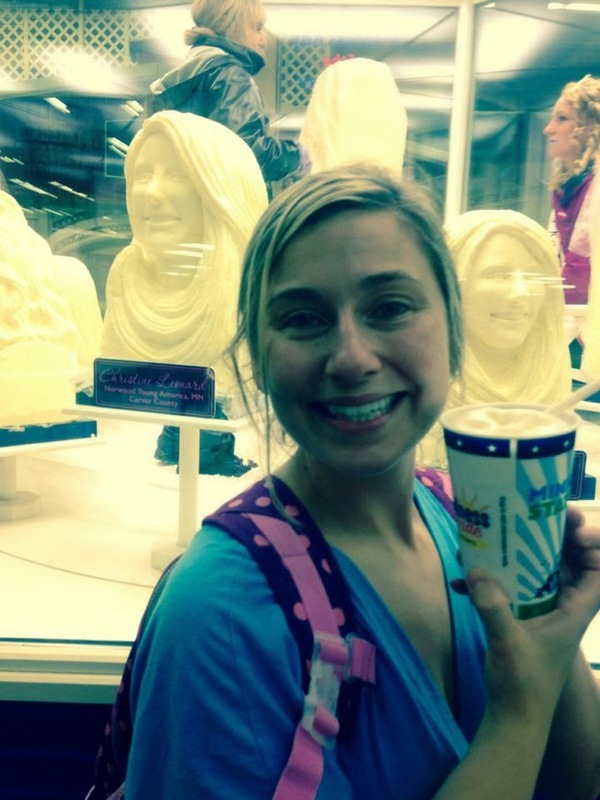 We also spent lots of time visiting and eating great meals, which we took turns preparing. Something we didn’t do was turn on the TV. While it’s fun to watch family movies and everyone has their favorite shows, it somehow seemed a waste of precious ocean hours to stay glued to a screen when there were so many better things to do. And so, before we’d even departed, I (as the Mama Bear) I made the suggestion. Why not take time to really enjoy our environment and each other, and leave that droning television set turned off? We were lucky enough to be staying oceanfront. Wouldn’t it be so much nicer to hear the sound of the waves? Much to my delight, and my husband’s as well, we didn’t receive a peep of complaint all week long. Instead, kids (well, they’re grown kids now, all 18+) and parents savored many of those simpler pleasures that can’t be gotten via pay-per-view. We challenged each other in corn hole, grilled burgers and brats, held a crab-eating fest, and even ate sticky s’mores. Most of all, we made memories, those precious mental pictures that are far more enduring than thoughts of another seasonal episode. While technology now enables us to download TV shows once we’ve missed them, there’s no way to wind back the clock and recapture special moments that might have been made. We’re so glad we took advantage of ours. Ginny Baird writes contemporary romance novels and novellas, ranging from traditional romantic comedies to short and sweet love stories. She’s recently released Book 4 in her Summer Grooms Series, The Getaway Groom. You can find it at Amazon, Barnes and Noble, iTunes and Kobo. 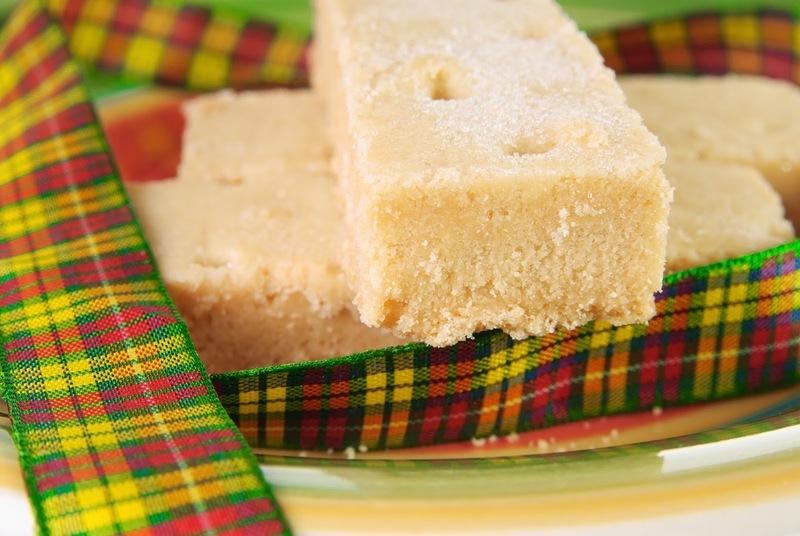 A number of my stories are set in Scotland and I've been researching specific Scottish recipes, especially cookies—or what we in the UK call biscuits—and trying them out. I made them into a dessert with whipped cream and strawberries on top (which didn't help with the queasiness) and the whole family enjoyed them. The next recipe I tried was something called Scottish Parliament Cakes or Scottish Parlies. Despite the name, they are definitely biscuits and not cakes. I followed the recipe, which was very easy, and had a wonderful surprise. My mother used to make sublime ginger biscuits when I was a child and I've never had them since. As I followed the recipe to make Scottish Parlies, it seemed familiar. It turns out I'd discovered the recipe for my mother's wonderful ginger biscuits. She is part Scottish, so I can only assume she learned the recipe from her mother. I had to give away most of the Parlies as they were so moreish I was in danger of adding a few pounds to my waistline. For all you cookie lovers, here is the recipe to try. 2. Sieve the flour, sugar and ground ginger together into a bowl. 3. In a saucepan, melt the butter and add the golden syrup or treacle. Bring to the boil, stirring continuously. 4. Turn off the heat and add the flour, sugar and ground ginger to the saucepan, a little at a time, mixing well with a wooden spoon. When half the dry ingredients have been blended with the butter and golden syrup, add the egg and mix well before adding the rest of the dry ingredients. 5. Drop dessertspoonfuls of the mixture onto a greased cookie sheet. Bake for 15-20 minutes. Place on a wire rack to cool. 6. Will keep for a week in an airtight container. Helen lives in South West England near Plymouth in Devon between the windswept expanse of Dartmoor and the rocky Atlantic coast. As well as her wonderful, long-suffering husband, she shares her home with a Westie a Shih Tzu and a burmilla cat. 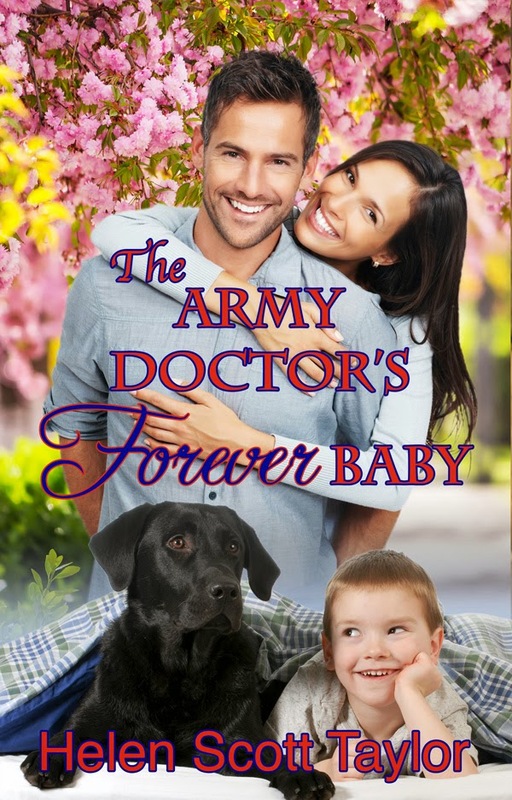 Helen's latest book is a prequel to the Army Doctor's series, The Army Doctor's Forever Baby. Find Helen on FaceBook and Twitter, or visit her website. If our cat was to put an ad in the personals for a fellow feline, it would say something along the line of "Must hate humans." She's probably always felt that way but we only became aware at Easter when we returned from a break - a mere five sleeps away and nothing out of the ordinary. At first we didn't think anything was amiss but it didn't take long to discover that something was indeed not right. We found Nook in the rafters of the garage, miaowing at us. Straight away we knew the problem. Yep, we said, she's quite clearly stuck, and we have to get her down, the poor baby, because she's forgotten how she got up there in the first place. And she's missed us terribly. There were several mistakes right there in that thinking. First, that she couldn't get down. Of course she could get down! This is an old garage that has stuff in it like old furniture she can jump down on to and she was, after all, up there on her own accord. The second error in the thinking was that she was miaowing because she'd missed us. Ha!. She was miaowing because we'd come home. Disturbed her newly discovered freedom. Had realised just how much she hated us and she wanted us out of there. Forget the fact we had "rescued" her from the SPCA and given her a half decent life. Nook hated us. Over the next few weeks she began to take off for great periods of time and we had no idea where she could be. Once I followed her by stealth. She leapt on the fence, walked delicately across it, jumped on the garage roof and when she crossed over the top down the other side and out of sight, I ran around the garage to see where she was. But she'd gone. I looked everywhere. In the garage, out of the garage, peered over neighbour's fences. She had vanished. 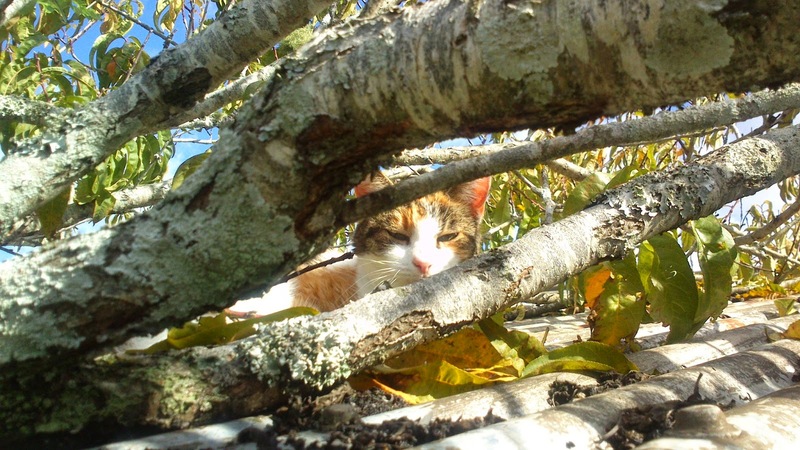 In fact, we eventually discovered, she had cleverly disguised her presence by settling on the rusty garage roof under the branches of the peach tree. She was perfectly camouflaged and intent on staying there, even when it drizzled and we tried to coax her down. In fact, even when it began to pour and I'd be out there with the umbrella telling her to get her cat backside indoors, she just miaowed. It was incredible to us that her hatred went so deep she was prepared to brave the elements. But I persisted in showing her she was still loved. Whenever I'd walk down the drive, I'd stop by the garage and greet her with a cheery "Hi Nook" and she would give me dirty looks. Then one day she wasn't on the garage roof, and we couldn't find her anywhere. It was coming into winter and it was wet and we were worried. We searched everywhere. Everywhere. Trespassed on neighbours' property. Got up in the rafters. Looked and called but as days went by, things were beginning to look bleak. "I've found her," one of the boys said, shaking his head in disbelief. We went outside and he pointed to her and I could only stand and stare in shock. She was living in the tree. She lay on a branch, looked with disdain at us and we gazed in horror. Our cat had chosen to live up a tree. In between hoping the SPCA didn't catch wind of this and press charges of animal neglect, we began to brainstorm Nook's thinking. She had beds to choose from, couches, carpet, wallpaper to scratch the life out of if. Maybe she was terminally ill, about to die, sparing us the misery of the pain we were about to endure? Mortified she had chosen to expire in the tree, we got her down, with difficulty, and brought her inside. She ran back out again. We locked her up at nights with a litter tray but as soon as the morning arrived, when she thought we weren't looking, she ran back outside and got back up the tree. And finally, finally, it hit us. Nook wasn't dying. She wasn't even sick. She just hated us and we'd been too dumb to realise it. We brought her inside again and eventually she humoured us and chose to live on the sink in the bathroom. This seemed cold and rather wet for the cat when you're trying to bush your teeth. Plus we kept finding cat hair in the soap. Then she decided to live on a barstool, which was a lot drier than the sink. Now she's utilising beds so we're breathing sighs of relief that we' re not bad cat owners - just owners of a cat with some serious mood swings . Cats really are a law unto themselves, aren't they? What bizarre things has your cat ever done that really makes you wonder what makes their little cat minds tick? Our dining-room table lost a leg. Let’s not go into what (or who) might or might not have been on it when that happened! The table was thirty-years old. That leg had been reinforced too many times to count. It was time for a new table. Having to make a major purchase like that didn’t do much to lift my spirits. Good news, though: IKEA was having a sale. Bad news: Even at IKEA’s prices, a table the size we need was going to set us back. 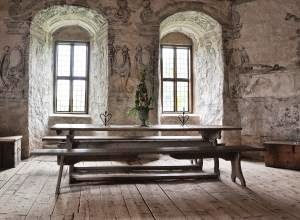 There was no other choice, though, since not having a dining room table was just not an option for us. 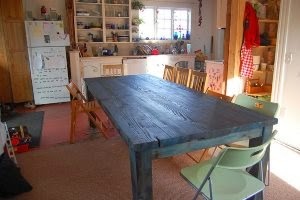 It’s where we cook, peel vegetables, knead bread, do homework, run “Mommy’s summer camp,” finger paint, sew clothes, read the paper, iron, knit in the evenings, check our emails, write novels, and — oh, yeah — also eat all our meals. So off I went, heavy-hearted and too light-of-pocket. I knew exactly which table I was getting (the longest one possible) and I was not — you hear me? — not! — going to browse. This was an important resolution, because I love IKEA. I can get lost there for hours. I love the shopping carts for people in wheelchairs. I love the circular bar where moms can perch and enjoy a cup of tea or lunch while their babies and toddlers play safely in the middle of the circle. I love the super-cheap breakfast: fresh roll, sliced Swiss cheese, olives, tomatoes, hard-boiled egg, butter, a small croissant, jam, and a choice of cappuccino or orange juice — all that for less than the price of coffee in the city. What’s not to love? Of course, that’s where I started, figuring I needed to fortify myself for the coming ordeal. I was surrounded by grandparents who obviously had discovered a day at IKEA is the best deal around when you want to take out your grandchildren for breakfast and fun. I saw all these grandparent-grandchildren groups later, watching the juggler and the puppet show in the air-conditioned lobby. Thus, well-fed and smiling at all the happy, rambunctious kids around, I went to find the table section. I set off with a determined step and made it half-way through the living room area. But that’s where the first “apartment” is. For those who aren’t familiar with how this company sets up its stores, it has sections that are designed as mini-apartments, to showcase how to use their products to maximize minimal living space. Everything matches. Everything is clean and neat and has its place. This one was modern and sleek. Black-and-white framed prints on the wall, stainless steel galley, leather couch — on which sprawled Alpha Hero, in his jeans, shirt open, reading a corporate report, his glasses pushed above his forehead, cockily beckoning me with a raised eyebrow … uhm … right. I think not. I retreated quickly and strode through the bookshelves, holding my hands up to the side of my face as blinders. I faltered when I caught a glimpse of the breezy chintz curtains in another mini-studio. The dishes in this kitchen were patterned in delicate pink buds. The glasses on the shelves were tinted rose. The bed in the corner was romantically draped with a tulle mosquito net. 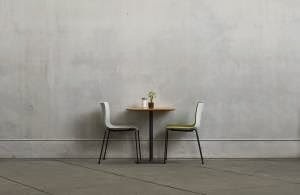 Sweet Heroine was sitting at the little table (painted raspberry), her blond hair pulled back in a neat ponytail, a cup of tea (in rose-bud sprinkled china) before her as she made notes to herself. A slight frown on her otherwise perfect brow suggested not all was perfect in Sweet Heroine’s world. I glanced around. This would not do. “A little too much pink, girl,” I muttered as I forced myself back on track. But before I could get to the tables, I had to traverse yet another apartment. It was barely larger than the previous ones. There was a kitchen — patterned dishes but stainless-steel cookware. I nodded in approval. The living area had the kind of love seat you just want to sink into with your beloved and never climb out of. Nice. A leather arm chair. Okay. A double-bed loft with slightly mussed sheets had a neat home office tucked underneath it. French windows opened up to a postage-stamp sized balcony with wrought-iron furniture. There were candles on the table, a night cityscape twinkling below. A warm breeze lifted the tendrils of Sweet Heroine’s hair as Alpha Hero stared deeply into her eyes. They leaned slowly toward each other, an invisible, magnetic bond drawing them ever closer … a bond that would last forever, like the gold of their wedding bands that gleamed softly in the night. A kid on a tricycle careened out of control and smashed into my calf, knocking me off balance. I caught myself on the balcony railing, my arm whipping right through Alpha Hero and interrupting the kiss. I figured that was a sign I was supposed to get on with it. No more hallucinating ... um, I mean ... browsing. How I picture our table. I bought the table. Its color doesn’t match anything in our house, but it was the only one in the store big enough and sturdy enough. At the curb I found two young men — future alpha heroes in training? — who kindly loaded it into our not-so-mini van. Sweet Heroine and her search for love started developing as I drove the long way home. Alpha Hero's background. 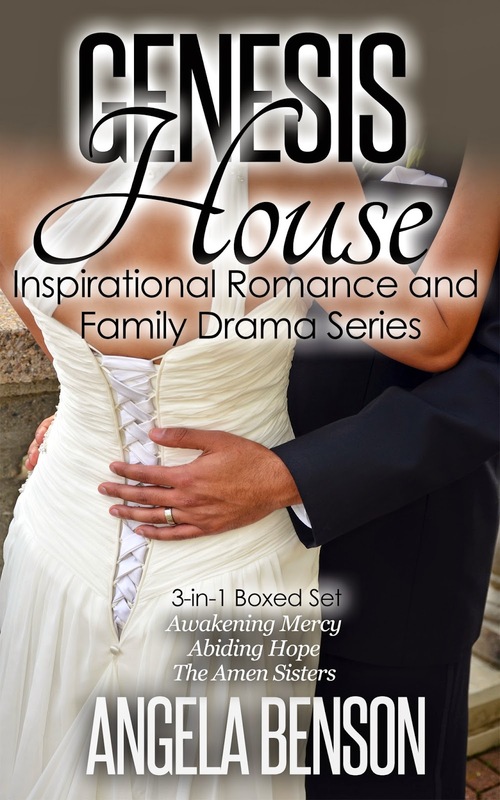 Their first meeting ... A kiss on the balcony of a homey, romantic apartment built for two — it would be the perfect ending for a book, wouldn’t it? An hour later, I pulled into our driveway. A mess of bikes blocked the way to the garage. I could hear Laurie Berkner — rock-star of the six-year-old set — blasting from the living room. I took my jacket off before even getting out of the car, to keep it safe from the dirty hands that were sure to decorate my dress in the next few minutes. The grass was muddy where the kids had been running through the sprinkler — and the sprinkler was still dripping. I went to the wall to turn off the tap and noted the three-dimensional footprints in various sizes that led the way to the front door, like avant-garde street art. I couldn’t help grinning. If Sweet Heroine and Alpha Hero were as perfectly matched as the furniture and throw pillows in their IKEA display, they had better enjoy their quiet balcony now because, no matter where the novel stops, I hope for them that what they have to look forward to is the perfect table in the middle of a muddy, mismatched, drippy, noisy, joyous riot. What's the most essential or meaningful piece of furniture in your home? 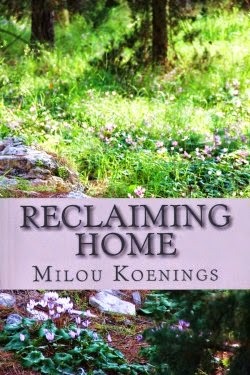 Her new release, Reclaiming Home, A Green Pines Romance, is available at Amazon. Writing is definitely my passion, but I also have a passion for teaching. 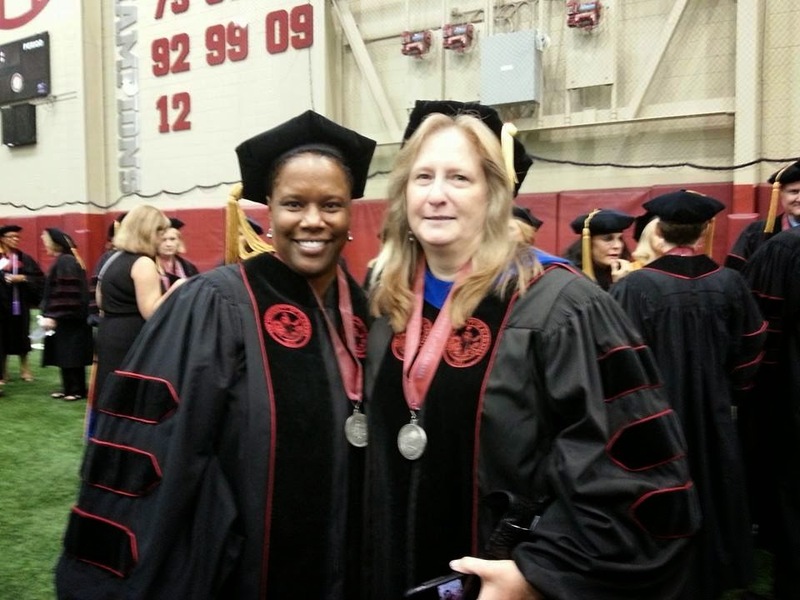 Earlier this month, one of my doctoral students, Kristi Garrett, became Dr. Kristi Garrett. The graduation ceremony is a special time for graduates and their families, but it does draw long since the time in the spotlight for any one graduate is pretty short. 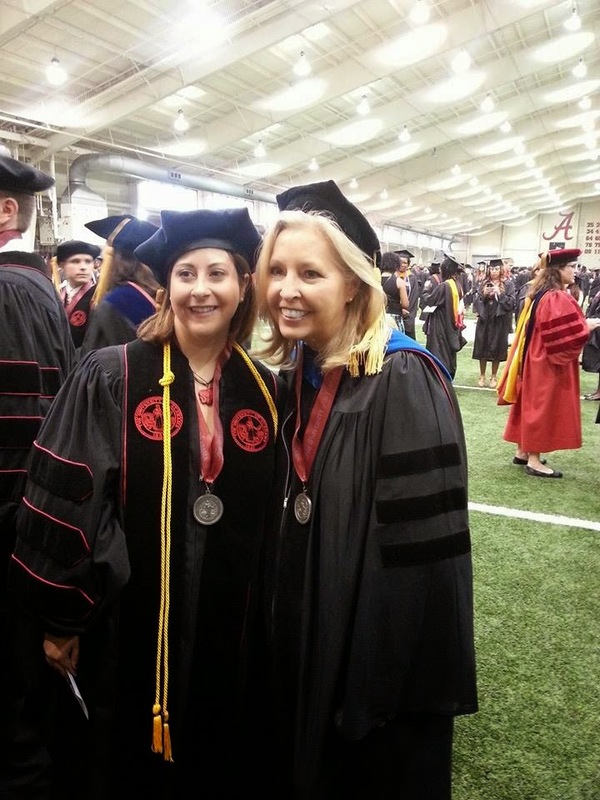 Doctoral graduates have to be hooded so Kristi and I both had to walk across the stage. When they called her name, I walked on stage behind her, stood on a block about four-to-six inches high and draped her doctoral hood over her head. Since Kristi is a bit taller than me and she has big hair, she had to stoop a little so I could do my job. After she was hooded, we proceeded across the stage where we shook hands with the Dean of the Graduate School and the President of the University. The path back to our seats took Kristi by the official graduation photographer, where she had her official picture made. And that was it for me and Kristi. Then we sat and waited while over 1000 graduates and undergraduates experienced their time in the spotlight. Kristi and I took the selfie you see while we waited for the ceremony to end. Our celebration didn't end with the ceremony though. Kristi (left) and two of her fellow graduates, Becky (right) and Veronica (middle), hosted a graduation luncheon at the conference center across the street from the coliseum where the graduation was held. So while Kristi stood in line to get her actual diploma (she only got the cover when she walked across the stage), I made the short walk to the conference center to join her family and friends in celebration. It was a lovely event. The graduates went all out in decorating the room. There were three rectangular tables in front that were loaded with gifts and door prizes. Then there were about 15 round tables, each designated for immediate family, special guests or committee. 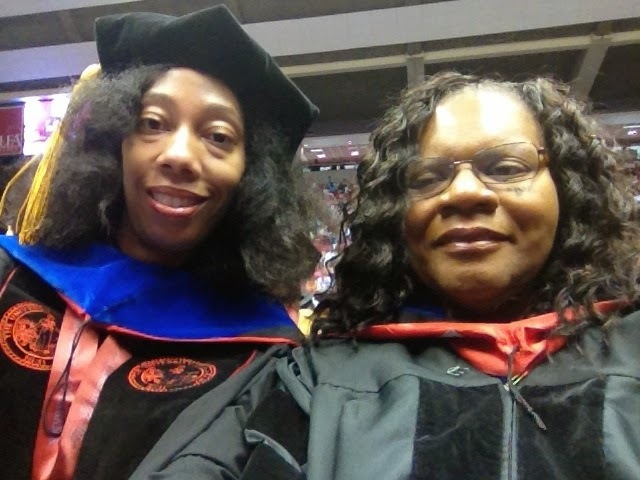 As Kristi's advisor and dissertation director, I sat at the committee table with my colleagues, Dr. Wright (Becky's advisor) and Dr. Rice (Veronica's advisor), along with the other members of the three committees and the Dean of the Graduate School. Having everyone seated at designated tables made it easy to meet folks. For example, I chatted quite a while with Kristi's mom and her two brothers and their families who were seated at the table designated for Kristi's immediate family. Before lunch, the graduates hosted a short program where each one of them gave shared words of thanks and appreciation and presented gifts. 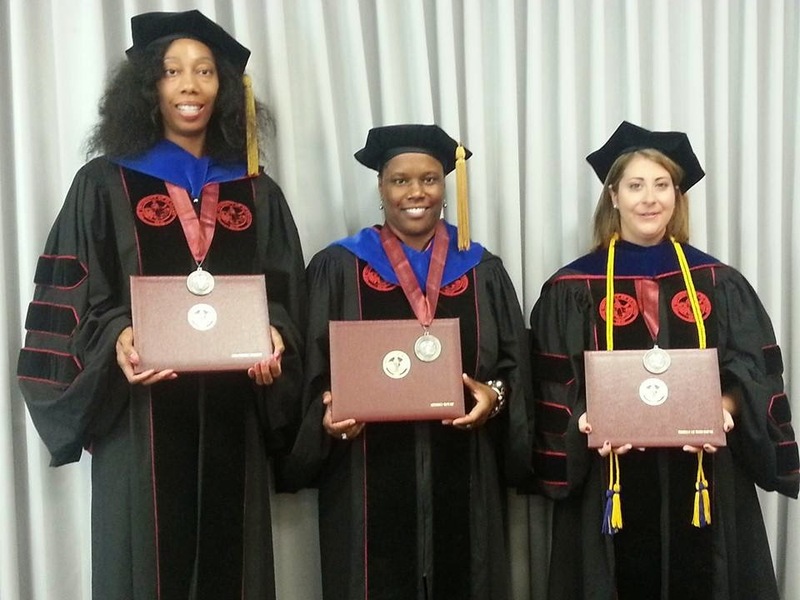 In a touching moment each of them presented bound copies of their dissertations to their parents. You can imagine how proud and happy those parents were. I was surprised when they also presented tokens of appreciation to their advisors. I'm not a touchy-feelly kind of person. Drs. Wright and Rice are known among the students in our program for being huggers while I'm the one who'll shake your hand. Well, when Kristi, and later, Veronica, called me to the front of the room and thanked me for supporting them throughout their doctoral program, I suddenly became a hugger. I remain surprised at how much the moment moved me. Students always thank you for supporting them but I've never taken the time to reflect on it until that moment. It was a bit overwhelming. Chairing a student's dissertation committee has its ups and downs. At some point tension arises between the student and the faculty member. It's inevitable, but it's also worth it. Bonds are forged that will last a lifetime. I consider myself fortunate to know the three ladies who graduated and to have played a role in helping them achieving their dreams. I feel about my students the way I feel about my readers. I'm amazed and humbled by the letters that tell how a story that I wrote encouraged somebody, gave them insight into a situation in their own lives, or just gave them a few hours of entertainment. So, thanks to Kristi, Veronica and Becky, for allowing me to share in their lives over last four-plus years, and thanks to all the readers who have invited me and my stories into their lives. I appreciate you all!